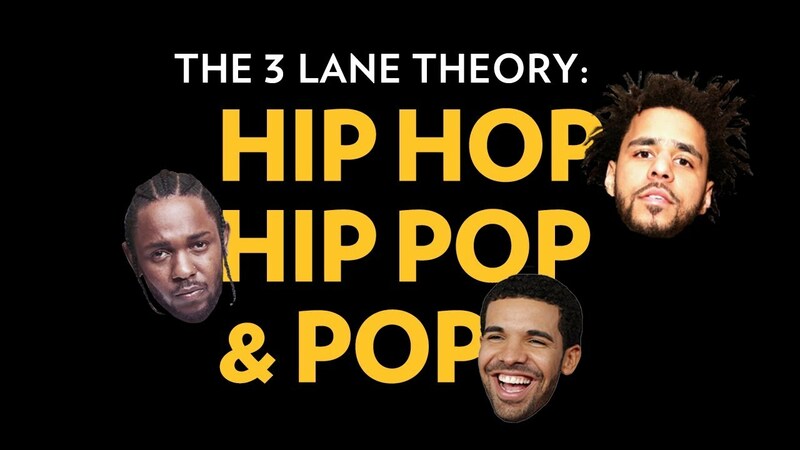 The Three Lane Theory: Is ‘Going Pop’ Healthy For Hip-Hop? On the Monthly Mumble podcast co-hosted by myself, 90BRO and Max Gavins, the latter introduced us to the “three lane theory”, he recently discovered through HipHopDX. According to Max’s findings, all of ‘hip-hop’ can be separated into three different lanes – pop, hip-pop and hip-hop. The introductory conversation identified Drake as pop, J. Cole as hip-pop and Kendrick Lamar as hip-hop. We argued however that in 2017, Cole and K dot had switched positions based on their latest offerings both sonically and in terms of commercial performance. Hip-hop heads often view pop and hip-pop with a sense of snobbery. Rappers with even a slight hint of mainstream appeal are brandished as sell-outs. If it’s not weed bars over boom-bap beats, hip-hop purists will often histrionically claim rappers who stray from the norm are ‘killing’ hip-hop. In actual fact, the opposite is much more true. Without artists making accessible music, hip-hop would not have the influence or power it has today. For a few, hip-hop is a hobby. Something people do ‘for the love.’ Which is cool, I certainly find myself in the same position, but not by choice. Whilst I would write about music regardless of payment if I could survive without it, the reality is, credibility (much like exposure) doesn’t pay the bills. Whilst I’m much more likely to listen to Joe Budden than Lil Yachty, there is a place for the mumble rappers. That place lies as a gateway. Artists who storm the charts like Migos, Travis Scott and Drake open the doors for new listeners intrigued by rap music to discover more credible underground artists such as Dave East, Joyner Lucas and Token. In the UK it’s no different. Tinie Tempah may face a lot of criticism for his ‘watered down’ version of rap and grime, but as a result of TT, many listeners would have dug deeper and discovered the likes of Jammz, Big Zuu and Capo Lee. Personally, I fell in love with hip-hop and grime around the time Chipmunk was releasing records like ‘Oopsy Daisy.’ Since then Chip has dropped the munk and returned to his roots, restoring his credibility after the Bugzy Malone beef. At around 14, a younger me wasn’t so interested in Eminem but began discovering the G.O.O.D Music roster via Mr Hudson’s ‘Straight No Chaser’ album and dug deeper into grime as a result of Chip’s 2010 tour. Chip’s show in Newcastle’s o2 Academy (it might have been Carling Academy back then) had a star-packed show with Marvell, Loick Essien, Bashy, Aggro Santos and more all involved. This also highlights the importance of stylistic diversity in local hip-hop in the North East of England. Whilst Rick Fury is an incredible rapper and has managed to maintain his credibility whilst making music that is easy listening, not every artist is quite so talented to bridge the gap. For every MC making rappity-rap over boom-bap production, we need a 90BRO pushing the boundaries experimenting with music on tapes like ‘Mediocrazy.’ Acts such as Kay Greyson, Sagaboi, J Smirk and Kema Kay are often outcasted as a result of their more pop-orientated sound but they’re the ones creating the gateway to discovering the likes of Just B, Sutherland and Rex Regis. If you take a look at who’s getting booked for cross-genre gigs its those artists with a more accessible sound. Many grumble about the amount of gigs Kay Greyson is booked for. Maybe she’s not entirely compatible with the likes of Lowkey, Akala and KRS One. Yet, in the latter’s case, she was booked for an out-of-Newcastle gig to support the hip-hop pioneer after impressing his team – something we rarely see from local rap artists. Speaking to TheRootMusic about why she gets these opportunities, Kay expressed that its about being ‘presentable.’ Other artists might turn up, turnt up, but she ensures she’s sober and able to impress promoters and tour managers with her professionalism. Even for crowds however, it’s much easier for new listeners to enjoy an accessible sound over rappity-rap. Even if someone in the audience at a gig with a local hip-pop support is after bars, this might be their first introduction to the existence of a scene in the North East. One way or another, they will discover the so-called more credible MCs as a result of the work put in by those sneered at by purists. It’s time to put some respect on the names of pop and hip-pop rap artists. Whilst I’m now much more interested in the Loyle Carner’s of the world, I’d have never heard ‘The Isle Of Arran’ without Chipmunk’s ‘Oopsy Daisy.’ Its healthy for hip-hop to have some artists go pop, if only for a way to build an audience for the genre and grow a wider community for the culture.